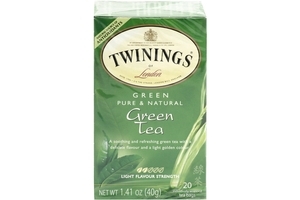 Twinings Natural Green Tea in 1.41oz (40g) box. Contains 2g x 20 tea bags/ box. Pure and Natural green tea smooth in flavor and refreshing taste. Green tea is known for its smooth flavor and refreshing taste. Green teas go through a process where the leaves are heated to prevent oxidation while black teas are oxidized for additional color and flavor. The result is a delicious tea that brews to a light golden color and unique flavor. Twinings Green Tea is a style called Sencha, known for its smooth, mild characteristics. Product of United Kingdom.